World demand for infection prevention products is forecast to increase 6.4 percent annually to $130 billion in 2017. Growth in emerging economies will lead gains as their health care sectors are expanded, modernized and adapted to formal infection prevention protocols. Protective apparel and textiles will remain the top selling product group. 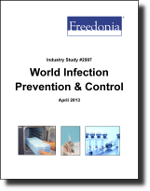 This study analyzes the $95.4 billion world infection prevention product industry. It presents historical demand data for the years 2002, 2007, and 2012 with forecasts for 2017 and 2022 by product (e.g., protective apparel and textiles, safety enhanced medical devices, disinfectants, sterilization products, medical gloves, infectious waste disposal products), world region and for 15 major countries. The study also considers market environment factors, details industry structure, evaluates company market share and profiles 30 industry players, including Becton Dickinson, Kimberly-Clark, and 3M.